In the meantime, can I distract you from my abysmal visit-returning record of late with this poppy? Yes? Okay then, here we go - and oh look, it's red too :). So many interesting and pretty things to look at in one photo. I've had the same problem during the last month, know what you mean. Very pretty ! spring moves slowly in and it starts to bloom ! what a nice season ! Two stages in such lovely light. Life intrudes so often, yet we may post less often - but always with the same quality! The poppy qualifies well for RT, the blurred green background with the bold ruby feels like a painting, as if oils or acrylic were used. It is beautiful! Love all the Red here - great shot! A delicious light, nice framing ... and those red poppies are really impressive, I love this photo. Sometimes you just need a break - I love your distraction. It's absolutely beautiful!! She walks in transparent beauty, and the Mom flower has a certain strong dignity too. Some days I make photos and words for pure therapeutic reasons. There are things I need to express whether my readers understand it or not. I find great freedom and peace in giving my thoughts and feelings wings. that. that is a beautiful picture of one of my very favorite flowers. Wow! Great job! So beautiful! It's a beautiful image of the poppy. Especially with the color contrast, the deep gem-like red against the green. Hi Robin! Your blog is looking fabulous over here!!! 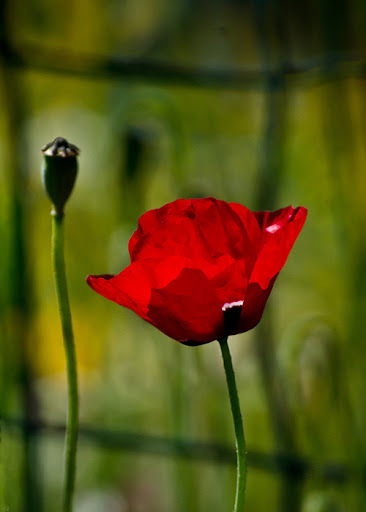 LOVE this Red Poppy shot and I just had to share it! !